Top-quality installation, repair, and maintenance for every manner of HVAC system. A heat pump is a comfort system that’s essentially an air conditioner that can operate as both a cooling and heating system. If your heat pump stops working, it’s important to find an HVAC contractor in Cherry Hill that specializes in heating and air conditioning repair. The simplest way to explain how a heat pump system works is that it’s an AC which has a valve (the reversing valve) that changes the direction the refrigerant moves. The indoor and outdoor coils swap jobs: now the outdoor coil absorbs heat, and the indoor coil releases it. Changing from heating mode to cooling mode and back is as easy as making an adjustment to the thermostat. We work with all makes and models of comfort systems, and we handle heat pump installation as well. How can we change your climate today? The obvious benefit of having a heat pump installed in your home is that it’s two comfort systems in one. You have your heating and AC needs met in a single installation. Energy efficiency: If you don’t have a natural gas connection to fuel a gas furnace, a heat pump is a more affordable choice for heating than installing an electric furnace. A heat pump doesn’t burn fuel or use electricity to create heat. It instead uses energy to move heat—which requires much less power. Less stuffy winter time air: The air from a furnace of any kind often creates a stuffy feeling in a home, and can lead to drier air. The warmth from a heat pump feels cozier and won’t create drier conditions. Having uniform, consistent temperatures in your home keeps you comfortable and messing with the thermostat less often. Lower Maintenance: Heat pumps require less maintenance than combustion based systems. This not only saves you money, but keeps your system running for a longer amount of time. Need Heat Pump Repair or Heat Pump Maintenance? Like any refrigeration system, a heat pump is a complex piece of equipment. We don’t recommend you attempt to repair one on your own or allow an amateur to do it. When you notice a drop in heating or cooling power, the heat pump is failing to property change modes, or any other system troubles, call for our service professionals. We take pride in getting the job done right the first time. Heat pumps must have routine maintenance twice a year: in the spring to prepare for summer, and in the fall to prepare for winter. We’ll see that your heat pump has the thorough tune–ups it needs for each season. If you sign up for one of our maintenance programs, you’ll save even more money on each service. On top of that you’ll get priority service 24/7. There’s no better deal out there! There’s one potential drawback with a heat pump: if it’s extremely cold outdoors, it’s harder for the system to draw heat from the air to bring indoors. To overcome this problem, we offer installation of hybrid heat dual fuel systems, i.e. a dual fuel heat pump. This combines a heat pump with a back–up furnace (usually propane–powered). The furnace turns on for the short periods when the heat pump may lose efficiency. Not every home needs a hybrid heat pump: we’ll help you find out if your home does. No matter the type of heat pump you either want installed or need serviced, you’ve come to the right people. At Climate Mechanics LLC, it’s our job to see that you have the best possible climate for your home, no matter the season. We have more than 26 years of experience serving Cherry Hill, NJ and the surrounding areas. Over that time, we’ve built up a solid reputation for being a quality HVAC contractor. Just check out our online reviews! Our service professionals work one–on–one with you so you’ll have the best comfort solution every time. Our technicians are not only excellent mechanics, they’re customer service experts as well! You may already have a heat pump in your home. 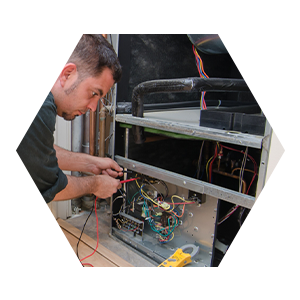 When you need service for it, such as heat pump repair, contact Climate Mechanics LLC. We’ll start you off with a free estimate and be with you every step of the way until the job is done.